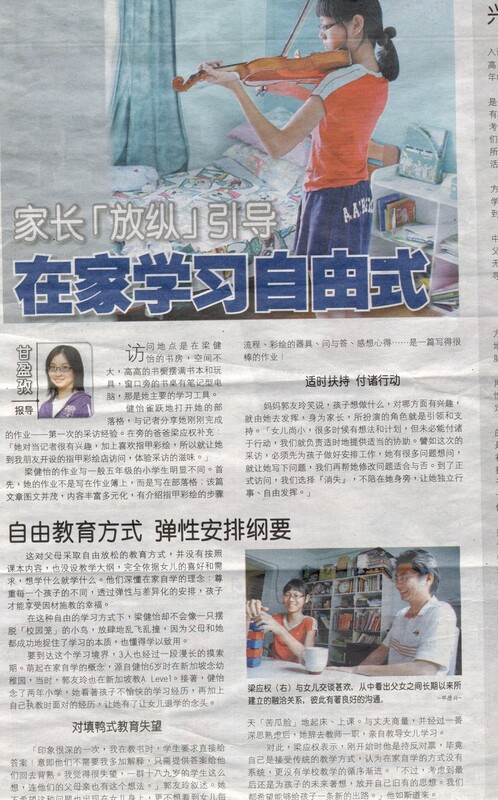 Of late, we have been getting a lot of interest on homeschooling in the Chinese media. We believe, parents are seriously rethinking Chinese schools. We think this is due to the fact that the Chinese medium schools in Malaysia are real pressure cooker which gives very little consideration to true bring out the true potential of children. Many children are not happy and people are starting to realize that. Someone remarked that the approach to education in Chinese schools is like “in China 50 years ago”. Could this person be right? We will discuss that in another time. Read on the article (translated into English) with Chinese images. Yu Ling and Kent with their 4 children are excellent unschoolers, if you are interested. In the current midst of the H1N1 scare, where hundreds of school-going students are affected, and some closures of schools, parents are deeply concerned with the health issues of their children, and the option of homeschooling is again, a talking point and being revisited by the paper. Homeschooling, where home is “school” and parents are “teachers”, is a long-term educational journey for the whole family, where learning activities are mostly done within the confines and safety of the home, the parents playing the role of facilitators and coaches. Yu Ling and Kent Leong have been homeschooling their children for 3 years, with the aim of giving their eldest child, Leong Jian Yi (11) a happy learning environment to absorb knowledge. Their home is a heavenly place filled with children’s laughter and happiness! Jian Yi is a fun-loving, knowledge-thirsty, eleven year-old, who loves to write. She has set up her own blog which she constantly updates, sharing her experiences and thoughts about her life. Lately, she has been posting her love for baking cupcakes in her kitchen. Their study area belongs to Jian Yi and her 3 little brothers, where they play and learn in a space where every object in every nook and corner is a specimen for learning! The family adopts the free-and-easy learning approach, where the children are free to learn according to their interests, and are not subjected to a fixed curriculum. They incorporate the true spirit of home-education, that is, following the children’s hearts, that leads to their true happiness. But before they embarked on homeschooling, Jian Yi attended kindergarten and early primary schooling in Singapore, while her mom, Yu Ling, was teaching the “A” levels there. They were both unhappy with the way learning was done – the pressure to conform to rote learning then was the factor that prompted mother and daughter to get out of the system. “The 18-19 year-old students I was teaching were not interested in knowing more about their subjects. All they had wanted was for me to give them the answers so that they could go home and have them memorized! This was utterly disappointing for me as a teacher!” Yu Ling lamented. And so they courageously embarked on the Unschooling method, where learning is interest-driven according to the child’s interest and abilities. And they have been unschooling since then. Contrary to popular belief that one cannot give a child too much freedom or else the child would be spoilt, Jian Yi, and others like her, have proven that wrong. Not only is she very disciplined in her learning, she is also self-reliant in seeking answers to her many questions. “She has become my teacher, especially when it comes to the computer!” Yu Ling admits with a laugh. Seeing her daughter learn new things everyday with a happy heart, and applying what she has learnt in her daily life, makes it so much more meaningful than trying the artificial way of getting A’s in school. However, Kent admitted that the decision to have Jian Yi learn under her mother was a bold move. But the advantages are obvious: they are able to understand their daughter’s learning styles and interests better, and hence give her plenty of room to learn and explore in that direction. As for their 3 younger sons, they will let them choose when the time is right, whether they want to attend school or to follow their older sister’s footsteps. “If the boys do not having any issues with attending school, then we shall not stop them,” reveals the father. This entry was posted in Commentary, In the news and tagged Chinese Schools, homeschooling, Oriental Daily. Bookmark the permalink. Hi, I would like to keep in touch with Yu Ling as I would like to seek her advise on the unschooling method she adopts. Good on her! 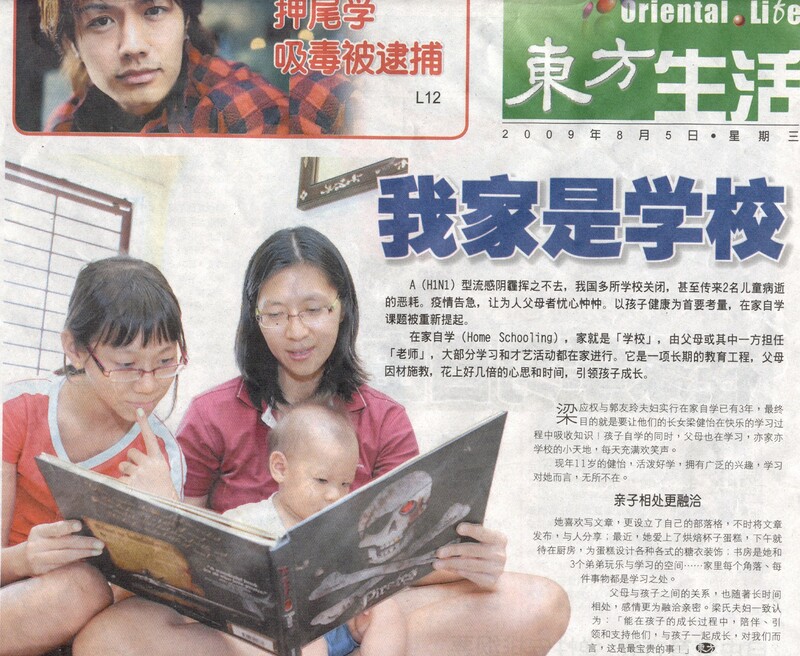 I read with interest the homeschooling experience that Kent and Yu Ling have undertaken with their children. I started to homeschool my daughter, 15, in January 2009, and I can relate to what they have said in this interview. I think what features most prominently in homeschooling is that learning is interest-driven and not controlled by a fixed curriculum. When it’s interest-driven you can then tailor your activities to the child’s needs as opposed to an exam-oriented fixed curriculum environment. Thus this ‘unschooling’ method allows the homeschooler to learn in a less restricted environment. If I may add, from my experience, the child learns in a stress-free environment. Homeschooling is a long-term plan: if you are not prepared to go the long haul, you could start when the child is in secondary. Personally, I feel it is good for the child to go through at least 6 years of normal/real (sekolah kilang) school. Hi, I’m interested in homeschooling my son who’ll be in high school next year. His learning method is very different from a lot of other children and he’s not very happy for many years. But, there’s this fear due to the fact that I do not know how to go about it. What more, I need to understand what sort of existing syllabus that I can implement as a start, so that I can have to confidence to pursue this path for the sake and for the future of my son. Therefore, I would appreciate any suggestions from experienced parents. To many people, homescooling means learning from a packaged curriculum, but in actual fact, that is the least of the priority. Our first priority should be to learn about our children – what makes them tick, how they think, learn and express themselves, what is their emotional intelligence, etc Our main role is to support them in their learning with our deep interest in their interest, and to help them achieve their dreams. Hi, Yu Ling. My son also 11 year old, he really not happy learing in school, and will be facing UPSR next year, is more tension to him. I wish to have some advise from you. Hi we have visited the Pinang ACE homeschool today. This is our 1st time to know they’re such a homeschool My kids are 7 & 5 this yrs & can’t decide whether to start them now or @ secondary ??? I really need advise asap .